SurfSignup Logo Created with Sketch. SurfSignup Logo Created with Sketch. 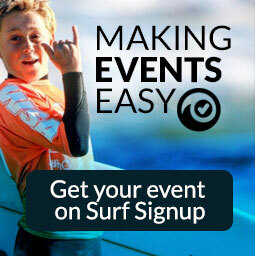 We make surf event management and registration easy... simple for you and for users. List your event on Surf Signup and get more signups by being seen by thousands of daily users. Below are some frequently asked questions. Surf Signup can only help with technical questions related to registration. If you have an event specific question like age questions, heat times and event information, you’ll have to contact the event organizer. If you aren't getting the reset password email, Contact Surf Signup. Memberships – I already paid membership and now I’m being required to pay again. Help, Need event info! Surf Signup is a service for the organization. We can only help with registration questions. We would love to help, but we don’t know anything about the event or heats. You will need to contact the organizer. Best place to find this info is on their website or Facebook page. Help, registration is closed! Surf Signup is a service for the organization. If registration is closed or full, you must contact to the event organizer. Many organizations have beach signups, but you’ll want to confirm that before going. We would love to help, but we can’t override the organizer’s settings.